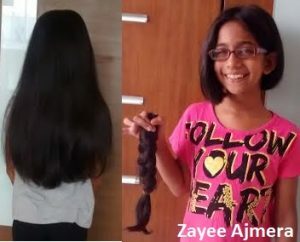 I was inspired by my cousin and donated my silky hair to make a wig for the people who suffer from one of the deadliest disease called cancer. I was so excited as well as amazed that I did such a worthy thing. Everyone around me is super proud and I got lots of touchy comments. After cutting my hair my head felt sooo light (almost felt like a feather) and I was really proud that my hair will be used for bringing a smile on some patients face.